Abraham Curry was the founder of Carson City, the first warden of the Nevada Territorial prison and the first Superintendent of the Carson City U.S. Mint. Curry arrived in this area of Nevada in 1858, purchased land with three other settlers, and in September of that year, proposed that a town site be surveyed and platted. Although lots were initially divided between the four landholders, the others soon sold or gave their sections to Curry. He shortly established a sandstone quarry which provided building material for many of the city's early buildings, and eventually became the first territorial prison where prisoners were put to work. 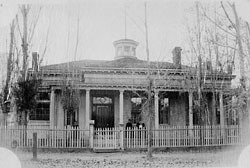 Among the other businesses Curry established in Carson City was a stone hotel where the first Territorial Legislature met in October 1861. Curry served as Warden of the prison for several years, but then became involved with the construction of the U.S. Mint, to which he was appointed Superintendent in 1869. Shortly thereafter he began construction on this house, and lived here until his death in 1873. Curry is credited with the design and construction of this residence, which is perhaps a bit reminiscent of buildings in his home state of New York. 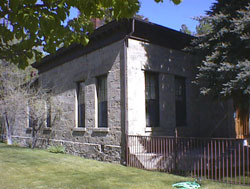 One of the few residences built in masonry in the late 19th century in Carson City, it is constructed of sandstone quarried at the Nevada State Prison, c. 1871. Although labeled "vernacular," the building incorporates elements of Georgian and Greek Revival design. The sandstone blocks were dressed with picks, plain chisels and tooth chisels, similar to the State Capitol's construction. Five brick chimneys appear along the roofline. The building originally included an octagonal cupola and five-bay porch, but these were removed around 1930. The rear wing was added at an unknown date by Abraham Curry's daughter Maryette, who conducted a private school there. The Abraham Curry House is located at 406 N. Nevada St., on the northwest corner of Telegraph and Nevada sts. in Carson City. Currently it is used as private law offices, and is not open to the public.